This is a remarkable Lifesize model of a White Bengal Tiger. It has amazing detail throughout. Look at this fantastic model of a royal Bengal tiger in white. Show your love for this beautiful animal by displaying one of our models and not harm this endangered species! With its textured body the fur effect really does look real from a distance, and it has additional whiskers which add to the realness. The tail is removable which helps with the packaging and shipping. 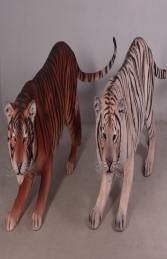 As every piece is hand painted, just like a real tiger the stripes can vary!